I love this picnic table set. It includes the table and two benches. I really love the modern lines and dark metal finish. Thank you Overstock! 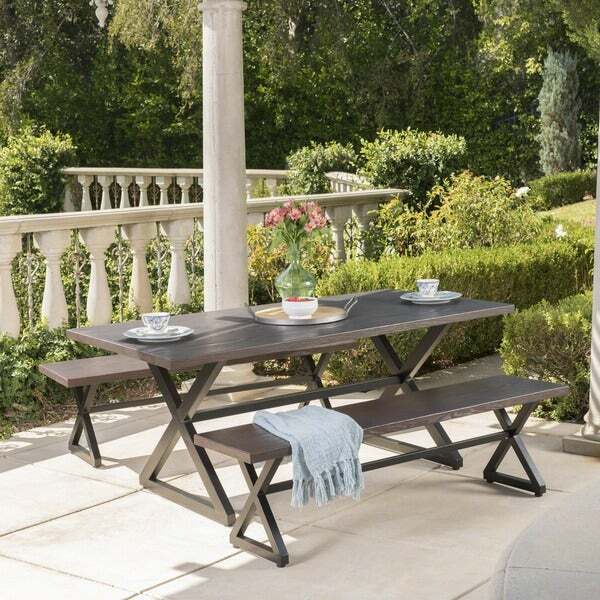 This broad, durable outdoor table and benches set is the perfect addition to your patio, backyard, or garden, giving friends and family the ultimate space from which to enjoy the outdoors. Made from aluminum cast to the highest quality specification, this is a purchase you are sure to enjoy for years to come. This set is really pretty. 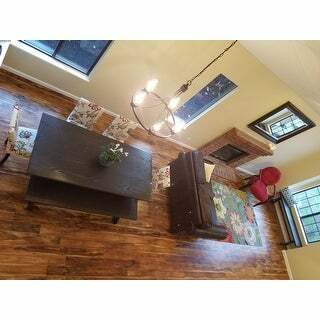 I used it to stage a home I am selling. I placed it in the dining room. Looks amazing! Tons of compliments! No one believed it was made of metal until the touched it. I assembled it myself quickly and easily. My husband was impressed. I plan to use it in my own yard once the home sells. This aluminum table looks like real wood and is perfect for my BBQs. Assembly was simple and it has gotten me to move more of my meals outdoors this summer. I may even bring it indoors for extra Thanksgiving seating this year. Sturdy and straightforward assembly. Beautiful and no fuss table—it seems like it will hold up over time. It has almost a wood finish that looks natural without dealing with the warping that comes with wooden outdoor furniture. Very pleased with purchase! Great quality, functional and quick delivery. Love the ease with which our kids can access the table! Several friends have mistaken the table for wood. Love this set! Love the look and color. I couldn't be more happy with my purchase. The fact that it is not wood, it should look great and and last for years to come. Very happy with this purchase. I would definitely recommend it. Very good quality. Very attractive and seems like it will withstand the outdoor conditions on our covered porch. Love the coloring- rustic look yet metal! Wonderful style and compacts to my space perfectly! Love the style and suits our needs to a tee! Can’t wait to picnic on it! Works well for the space I have. Love that all I have to do is run a damp cloth over it every once in a while. "Is there a hole for umbrella?" No, this table does not have a hole for an umbrella. "This bench table set says color is “brown”, but the images look gray. Are the images gray but you no longer carry the gray option?" I was looking for something simple, classic and durable and found this. It will be perfect for my crazy wild English fairy garden! "Are there chairs that coordinate with this set?" "How many people can sit comfortably at this table? " "I purchased this set and there is a warning label on it saying that California Prop 65 warning: This product contains chemicals known to the state of California two cause cancer and birth defects or other reproductive harm. If that had been printed in the advertisement I never would have bought this set. I would like to have information about the chemicals that are contained in this table and bench set!" Proposition 65 is a California law that requires warning labels on products shipping out of California. Prop 65 warnings are extremely common and appear on all types of products. We realize you may be worried finding this warning on our products, but we want to reassure you that the hazardous exposure limits for any of these chemicals have never been found on furniture products that we’ve shipped to our customers. "Will these benches fit completely under the table? 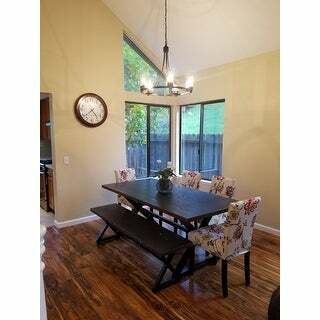 I need a table with these exact dimensions with benches that fit completely under the table."